In the world of professional wrestling, there is no official diagram for success. A performer could do everything right in the ring and get booed when he is supposed to be cheered. A character can come up with a “catchphrase” and be the most popular name in the world, yet have no skill whatsoever. Different characters perform and entertain millions for a couple hours every week on TV and at live events, and have cult-like followings. Sometimes there is no logical reason or explanation for why a character is so successful. The decision ultimately comes from the fans. 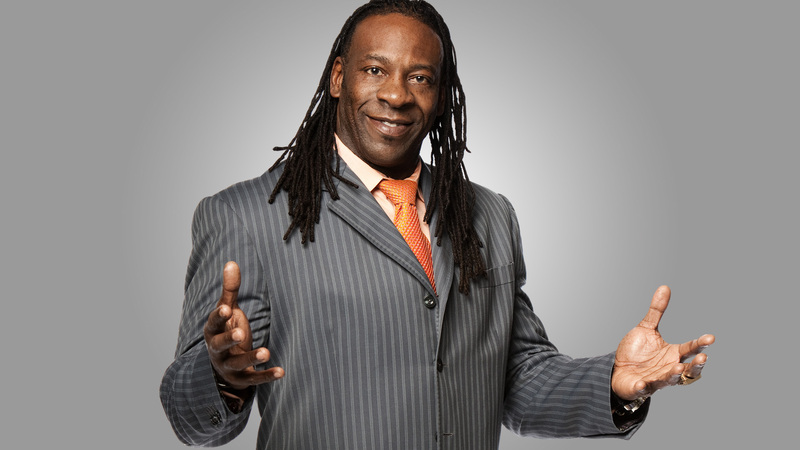 One of wrestling’s most successful characters has been Booker T, played by Booker Huffman. Huffman has traveled around the globe and has been World Champion in two of the world’s biggest promotions. He has had the life and success people dream of; he’s also been one of the most hated and beloved personalities in wrestling history. Ironically, it didn’t start out that way. Huffman suffered major setbacks on the path to success, including the loss of both of his parents and growing up on the streets of Houston, Texas experimenting with drugs and crime. Huffman was released after a brief stint in prison and found his calling in the ring. Recently, Medallion Pressreleased Booker T’s Story, From Prison to Promise: Life Before the Squared Circle,available now. In an exclusive one-on-one interview, Randy Zellea of Back Sports Page recently spoke with Booker about the book, his personal interests, growing up in Houston, and breaking into the wrestling industry. Q) Can you tell us about the decision to write your book? A) I thought it was something that needed to be done first and foremost. I hope it can help kids and young people who perhaps find themselves in a similar predicament that I was in growing up, not knowing which way to turn. Just probably needed that little extra inspiration to just keep moving in the right direction and that was really why I did it. Jim Ross from WWE was the one who did my contracts at the time and he was telling me I should definitely tell my story more than I had been. I thought about it and decided if I was going to do it, I had to start working and do it with a realistic perspective. I didn’t want to make it a feel good story or sugar coat it even though the outcome worked out well. Q) How involved were you in the writing process? A) Well, I figured I wasn’t going to be here on earth forever. I’m a realist; I owe a lot in my life to being in the right place at the right time. The man upstairs blessed me and I just feel I was put here for a certain reason. I think it’s me being genuine and honest about who I am and what I have done. I have been through a lot but the key is, I never changed who I am as a person. Q) Did you find it difficult going back to write your story? A) Not really, I found it harder to actually read the story. Writing it was easy. Reading takes me back. Certain aspects hit me hard, like losing my mother at such a young age. That kind of stuff really took me back compared to other aspects of the book. I don’t think my life was all that bad as a kid because you can’t miss what you never had. I was just in a bad position then. I was trying to deal with situations that I couldn’t control. Hard to move forward that way. Q) How much of an influence was your brother? A) My brother really wasn’t that instrumental in the early part of my life. When my mother and father first passed away, we really weren’t that close. My brother didn’t really walk back into my life until after I got out of prison. He was willing to help me find a job and gave me some great advice: “No matter what job you have, whether it is digging ditches or washing dishes, do it to the best of your ability until something better comes along. That’s all I ask.” I think he was saying that so I don’t make him look bad (laughs). I took that advice until something better did come along… and it was wrestling. My brother introduced us to the wrestling game so I followed him and I think everything worked out from there. Q) Television tends to portray prison as an awful hell hole. How does the reality compare? A) Honestly, what you see on TV has a lot of truth to it. It really does. What state you’re in has a whole lot to do with it. The Texas Department of Corrections is known as being a pretty hard place to do your time in certain aspects. Of course there is gang violence and riots that break out. You got your cliques, and different races. You have to watch out at certain parts of the day because everything is structured toward keeping the peace. It’s really not that different from being on the outside in certain ways. I look at it like I put myself there so I had to pay the consequences and get through it and move forward. Overall, though, it’s not much different from the outside world with the exception of the freedom to come and go as you please. Q) What advice do you give children who have lost or never met their parents, who watch you every week on TV? A) First and foremost, if I could do it, anyone can. I lost my father when I was 10 months old. I don’t blame my downfalls on the loss of my parents. That’s one of the biggest traps that kids today fall into. They seem to want to blame other people or sometimes even God. That’s the one thing you can’t do. Do not blame anybody, just do the right thing for you. Having mentors in your life is very important, try to gravitate to the right mentor. Not being a follower is also very important. And don’t succumb to peer pressure. I encourage young people to become leaders. That is how you develop success. Q) Have we grown enough as a society or is there more we could do to help these kids? A) We have grown a lot but in a sense we haven’t in so many different ways. I was working with Triple Threat out in Chicago, and to see the troubles that these kids have gone through in the cities and the land mines they have avoided blows my mind. I spoke with a group of kids and they would rather come up here and speak with me than hang out on the streets. It’s really hard out there and sometimes kids just do not know where to turn. It’s important they have a good example and are shown that there is light at the end of the tunnel. I think society has done a better job for these kids, but we could do so much more. Q) Is it true you were very involved with music growing up? A) I played the trombone, tuba, baritone, anything low brass, as well as the drum major. I was very involved as far as music was concerned. Music was something that made me feel safe. I love all kinds of music from country to hip hop, everything. I totally get lost in it. Q) How do you feel about schools cutting their arts and music programs? A) I am taken aback when I hear things like that. I do a lot of fundraising. I am down here working with schools and do shows that help raise money for the arts and music programs. I don’t like that they get cut because music and the arts helped me get to where I am today. All of the characters and mannerisms you see me play are always spoofs of what you see from TV and the Shaw Brothers’ movies. I watched all of them when I was a kid. Art and music are a way of life and if they get cut, you might be handicapping a child’s life.Q) You were involved with football and basketball growing up. How does that differ from wrestling?A) I didn’t play organized football, I just played in the neighborhood. Basketball and football players all grew up athletes. Wrestling requires you to be a great athlete and a great artist. When playing any team sport, you have to have total dedication and you become structured to win. Wrestling is an art, like a dance. Both win at the end of the day. Q) Are you a big sports fan? A) Definitely! I watch MMA, lots of boxing, I am a huge golfing fan, and I do a lot of channel surfing. Right now, I am watching a lot of basketball. Watched the Heat lose to the Bulls and stop the streak. Huge sports fan. Q) Do you like the Heat’s chances to repeat this season? A) I think the Heat peaked at the right time last season. They have home court throughout the playoffs. I do think they will pick up a lot of steam and win it again this year. That is my guess because of how good they are. Q) Do you think the Big Three take too much criticism? A) Definitely look at Tom Brady of the Patriots. When they are winning, everyone wants to see the Patriots lose (laughs). It is just a way of life. I think people would want to come and see them lose. People love a winner and hate a winner at the same time. Q) Are you a diehard fan of the Houston Rockets? A) No. Not since the ‘94-‘95 season. Not since Hakeem the Dream was in a Rockets uniform. The Rockets just really don’t have a good team right now. Of course, I go out and support them when I can. Clutch the mascot and I are really coo—we have our skit we do when I attend games. I love the Rockets but I just don’t like the direction the team is going as far as their management is concerned. We don’t really get the big money players here in Houston. It has always been that way. If Hakeem wasn’t a Houston guy, he wouldn’t have been here either. Q) Well, they have bounced back and signed Jeremy Lin and traded for James Harden. That’s good, right? A) That is just Houston. We will go out and get Jeremy Lin after he leaves and has success elsewhere. That is our MO. That goes back to the Oilers. Houston just can’t get a consistent winner. Q) How did you get started in wrestling? A) Wrestling to me was a hobby. It wasn’t something I thought I could turn into a career to make money or anything. It was different than hanging out with my buddies and getting into trouble. Wrestling was a safe haven for me. It gave me structure and the opportunity to have camaraderie with people and see them in a totally different light. People weren’t the same color I was or the same way. My first plane ride ever was to Japan. It was the first time I was ever out of Texas. Next thing you knew, I was out in Tokyo and had an amazing opportunity to see what life was like overseas. You don’t realize how clean it is out there. Such a different way of life and it was an education for me. When I started wrestling, I realized I had found something that I am really good at. I wanted to hold on to it as long as I could. That was the mind set I had, not because I was a star or the money. Q) Did the Chris Benoit tragedy in 2007 change the wrestling industry? A) Yeah, I think it has. Not just in wrestling but in the NFL, as well. It changed a lot of focus on guys on how to handle their health and other situations. I think our wellness program is something I wish we had when we were coming up. The young guys have a better chance of walking out of the game than limping out or staying in longer than they should. The doctor is going to say your time is up. In some ways, this tragedy has helped many and it will continue to help the younger talent in our business grow. Q) Some of the funniest moments I had seen were when you worked with Goldust. How was that? A) That was another opportunity to show a different side of myself. Working with Goldust was awesome. At first, I was wondering what I would be able to get out of the experience because it really didn’t feel like it was the best combination from where we started. We clicked and made the best TV possible on a weekly basis. Being put in those situations gives you the opportunity to shine in a whole different role as I was able to build on my improv skills. Our chemistry and timing were great together. Every week, we had an open mind and no matter what we did, we had fun. I loved the 7-11 skits we did as it gave me the opportunity to bring comedy out of my persona. We were two of a kind and made magic together. I always tell my students if you can make a fan laugh or cry, you are doing your job. With Goldust, we were just breaking up and the crowd cared about us and it showed we did our job. Q) Talk to me about the supermarket battle with Steve Austin. A) Everyone remembers this when they see me. My thing at the time was to play everything straight and as serious as I could possibly make it. I had been running from Steve Austin for weeks and trying to get away from him. I thought I was safe from him at this grocery store (laughs). I almost hit this customer because I thought it was him—he was bald and so on. Then we heard him on the loud speaker and the rest was magic. It was not something we could do over and did it all in one take. Steve and I went out there with the objective of making it the best we could make it. We battled across the market and it ended with me crying after getting hit with produce (laughs).These are the things I remember more than the matches. Stuff we did with the Boogeyman was great, as well. Q) Who are some of the guys you liked working with in the ring? A) One guy is Chris Jericho. I loved working with Edge, Christian, and Lance Storm. Even Bret Hart. I loved working with all the Canadian guys (laughs) as I always had my best matches with them. I can’t remember having one bad match with those core guys. I always had quality matches with them because I think we mixed so well and had the intangibles for something special. Q) How did it feel to return to the WWE at the Royal Rumble back in 2011? A) I had goose bumps and was shaking because I didn’t expect that at all. It’s just the way my career has been. I never really expected things, not good things anyway. Mostly because of the way I grew up but the ovation made me feel really good about the work I put in. I tell people that ovation was given not to see me wrestle but just to see. The ovation was telling me that they appreciate all the work I had put in for so many years. They told me it wasn’t about the wrestling at all, it was about the relationship I had with the fans over the last 20 years and it was something I will never forget. Q) How do you look at your role now that you have been inducted into the Hall of Fame and your current position in WWE? A) I think that I have to keep working. I respect the young guys and I know they respect me. My job now is to help mold the young guys and let these guys know what to do and help them get over with the crowd. As well as to teach them what they need to know and help them as much as I can. That is the role of a true mentor, a true Hall of Famer, a true legend. That’s the role of someone who is not afraid to give back to the young guys and pass that torch. That’s where I am at with my career right now. I am so content where I am. I always thought about retiring and hanging my boots up. I thought about that when I was 30 years old. I was thinking about getting in there to make my final run. Life couldn’t be better for me. I have a great family and everything is going so well, I couldn’t ask for anything more than I have right now. Q) What are some of your other projects? A) I started my next book, called Rise to Wrestling Royalty. Of course, we have my Booker T Fight For Kids Foundation. We try to scholarship a kid every year. Then I got my wrestling promotion and school where guys want to be the next Bret Hart and Booker T’s. We have a new project we are trying to put together, which is a cartoon called “Adequate Man” and that should be coming soon. We have another project called “Dancing Diaries” that chronicles the life of an exotic dancer. We are trying to grow our development wrestling promotion so we can work with the WWE like a minor league. If they could bring them to me, I could train them and get them out there. I just want to maximize my business. Q) What advice do you give younger guys trying to break into the industry and going to wrestling schools? A) I used to talk kids out of coming in to my school (laughs). One of my prize students who started at the age of 17 and couldn’t even do a roll, his name is Luis. I told him to come back in a year and he did and he still couldn’t do it so I asked him again to come back in three months. He still couldn’t do it but I took him in because he said it was his dream and it was something he wanted to do. We run shows through the school and one of the guys couldn’t make the show. I told him, “If you can go out there and show me something, we will put you on the show.” He did great and has been on ever since. He learned so much by sitting on the sidelines, taking notes from an outside perspective. The key is never judge the book by its cover. Work hard, build camaraderie. Treasure the journey and the friendships you make on the way. Try things when you have the opportunity so you don’t look back with regrets.